The perfect murder. 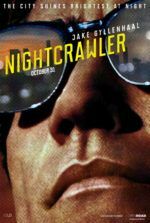 So many cinematic killers have tried and failed to carry out a flawless crime. Watching them try usually proves to be an endurance test in suspense because their schemes seldom go as planned. More often than not, everything goes south, and it’s often thrilling to watch them scramble to keep it together. The resulting suspense revolves around whether they will face moral justice or even survive the ordeal themselves. 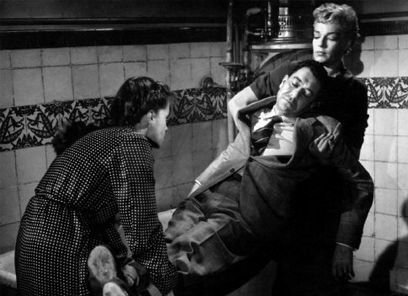 In Diabolique (Les diaboliques or “the devils”), Henri-Georges Clouzot’s haunting shocker from 1955, the murderers carry out their plan just as it was conceived; but even after getting away with it, this macabre tale isn’t finished with them. Nothing about the film proves so simple and, as it turns out, the audience was never in on the real plan. 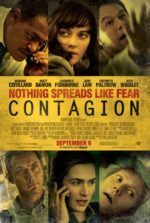 Despite the onscreen planning and scheming by the film’s murderers, the clever story has many secrets that go unrevealed until its several shocking turns in the climax. Clouzot transports his audience into an uneasy world that, early on, implants unearthly suspicions and ghostly hints, leaving us to feel anything is possible during the film and long after it ends. Even so, with a seemingly perfect murder at the center of Diabolique, the film’s influence lasted far after its release, most prominently in Alfred Hitchcock’s Psycho (1960). Appropriately, the Cahiers du cinema’s leading critic André Bazin called Diabolique Clouzot’s “most perfect” film, despite being secondary to the director’s previous picture, The Wages of Fear (1953). Diabolique and its brand of suspense would eventually become synonymous with the director’s name, though his career was far more erratic and far less prolific than his contemporaries. Clouzot studied the art of story structure early in his life and career, and his eventual mastery of story shaped his later films. Born in 1907, as a child in France young Clouzot wrote plays and spent hours reading in his father’s bookstore. By the time he started working, he wrote plays and adapted foreign screenplays to German for UFA Studios in Berlin. During this time, he became immersed in the works of Fritz Lang and F. W. Murnau, along with other German Expressionists. After he was fired by UFA in 1934 for his friendship with Jewish producers, Clouzot found himself in Switzerland the next year, where he would stay for almost five years, bedridden with a debilitating case of tuberculosis. In a sanatorium, he read several books on the art of storytelling and also quietly observed the people around him, learning much about human frailty, death, and physical and psychological suffering—all thematic elements that would have a place in Diabolique, as well as other Clouzot films in the subsequent years. By suffering for years, Clouzot grew more concerned with human suffering than the nationalist- or politically-minded cinematic concerns of the period. His time at the sanatorium established in him an appreciation for the limits of human misery and, perhaps because of that, he later became an expert at extending that feeling into his films, particularly in tales shaped by their suspense. When Clouzot was eventually well enough to return to France, he came home to a different landscape now marked by the German occupation of World War II. After early, more dismissible films, he made Le Corbeau (The Raven, 1944) under France’s only operational film studio during the Nazi Occupation, the German-run company Continental Films, headed by Alfred Greven in Paris. After the successful detective story L’Assassin habite au 21 in 1942, Greven entrusted Clouzot to make Le Corbeau, based on a true account of a woman who wrote poison pen letters in France. The story considers a prewar town located “anywhere”­—a place that quickly falls apart when the townsfolk’s secrets become public knowledge because of anonymous letters. The situation clearly reflected Vichy France, but many critics and political ideologies of the period objected to its message: the Catholic Church, the Vichy regime, the Resistance, and Continental Films each lashed out at Clouzot for his humanist indictment of those who collaborate, inform, and help the enemy. After the Liberation, Clouzot’s film was banned and he was charged with collaboration, then ordered never to step onto a film set again—a charge later dropped after several filmmakers and creatives (among them Marcel Carné, Jean Cocteau, and Jean-Paul Sartre) came to his defense. 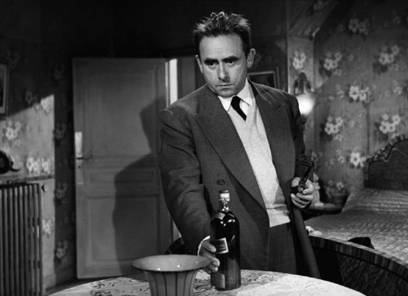 Once vindicated, Clouzot went on to direct moderately successful detective stories and tales of intrigue such as Quai des Orfèvres (1947), Manon (1949), and others. He achieved international acclaim with The Wages of Fear, about down-on-their-luck workers asked to drive nitroglycerin-loaded trucks across bumpy terrain for an American oil company. The film took home the Cannes Film Festival’s Palme d’Or, the Berlin Film Festival’s Golden Bear, and earned Clouzot enough influence to make Diabolique. French authors Pierre Boileau and Thomas Narcejac released the book Celle qui n’était plus (She Who Was No More) in 1952. Being fans of Alfred Hitchcock, they hoped he would option their book’s film rights. And while Hitchcock is said to have attempted to secure the rights, it’s also said that he missed the purchase by a matter of hours. By that time, Clouzot had already bought Boileau and Nercejac’s story for release by the French distribution company Cinédis. 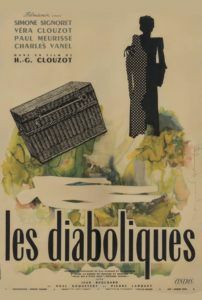 After Celle qui n’était plus, later renamed Les diaboliques in France, Boileau and Nercejac wrote several more novels with the hopes Hitchcock would adapt them. 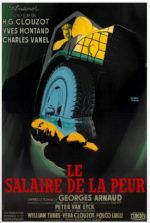 Only after seeing Diabolique, the film’s U.S. title, did Hitchcock seek out a property by the same authors to adapt, eventually landing on D’entre les morts (From Among the Dead) —the 1954 book that Hitchcock turned into his masterpiece among masterpieces, Vertigo (1958). In subsequent years, it became clear that Hitchcock loved Diabolique and considered losing the rights to Clouzot a major missed opportunity. He screened the film countless times both personally and for screenwriter Alex Coppel before filming Vertigo. What’s more, Diabolique continued to influence the Hollywood director for years. When the New York Times interviewed Hitchcock about Psycho in May 1959, the Master of Suspense described it as a story in “the Diabolique genre”. However, the film has far more in common with Vertigo, as both have a pointedly French quality about them, existing in a narratively poetic, abstract cinematic world; both are about a murder that leads to ghostly apparitions, which in turn reveal themselves as part of a twisted, terrifying, and grounded reality. Trapped in their routine lives at a school for boys just outside of Paris in a provincial town called St. Cloud, the characters of Diabolique inhabit a dismal world ornamented in dreary details by Clouzot and his cinematographer Armand Thirard. The opening shot of the school’s unkempt pool shows all the scummy reality of human potential in the filthily black water, offering an apt metaphor for the corrupt choices made by the film’s dissolute characters­—their stagnation and impending doom, as the pool becomes a source of murder and terror later on. The school’s headmistress and headmaster are Christina (Véra Clouzot) and Michel Delassalle (Paul Meurisse), a burningly unhappy married couple. Weak in composition and will, Christina, who Michel describes as a “cute little ruin”, nonetheless comes from a wealthy family and supplies the funds to keep the school running. Michel is controlling and abusive, both physically and psychologically, to both his wife and mistress, Nicole (Simone Signoret). A moody blonde bombshell with a questionable past, Nicole serves as the school’s science and math teacher, and her affair with Michel is no more savory than it is secret. Michel’s cruel treatment extends to his duties as headmaster, and his scant management exceeds all definitions of frugality. He keeps the students underfed and issues harsh punishments for small offenses; he reserves no kindness for the rest of the staff, which suffers cheap wine and spoiled fish at a meal, all to save Michel’s budget a few francs. The situation cannot go on much longer based on this setup. Indeed, not long into Diabolique, it becomes evident Christina and Nicole have already discussed and planned Michel’s murder. Although thoroughly reluctant at first, Nicole soon convinces Christina to go through with their plan, which involves Christina staying at Nicole’s home over holiday break and from there calling Michel to say she’s leaving him. When Michel arrives, she treats him to a drugged drink, and afterward, she and Nicole submerge him in a full bathtub. Once drowned, they cart his body back to the school in a large wicker trunk and dump his corpse into the scummy pool, where it will remain until discovered by one of the children or faculty. Except, when the pool is eventually drained, Michel’s body is nowhere to be found. Strange occurrences begin all around the school. The suit Michel was wearing when he died is returned from the dry cleaners. A child named Moinet claims he saw Michel alive, and he scolded him for breaking windows with a slingshot. “I know it was him. I know it,” says Moinet. Finally, Christina all but collapses from her fragile heart when she sees what appears to be Michel standing in the background of a recent class portrait. Convinced Michel’s ghost is haunting her, the trembling Christina investigates a shadow one night, leading her to the sounds of a typewriter. She follows them down a long, seemingly endless hallway to Michel’s office, where on a typewriter a piece of paper reads “Michel Delassalle” over and over. When she screams in fright and races back to her room, she sees Michel’s body there, in the tub. It rises out of the water slowly and reaches out for her, sending Christina into a massive, mortal heart attack, her guttural wailing ringing out until her death. The sound of her death cry is branded on the viewer’s brain. All at once, Michel removes the contacts from his eyes and he smiles in victory. This must be one of the most shocking moments in all of cinema. We quickly learn he and Nicole planned the whole scenario so Michel could inherit Christina’s fortune. 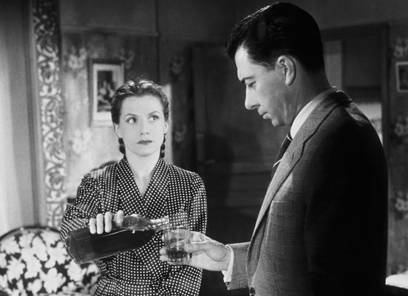 Although the film ends with Michel and Christina captured by a lingering private detective who overhears their confession, playfully played in a pre-Columbo-type role by Charles Vanel, Diabolique offers a chilling conclusion. As the school closes with its headmaster arrested and headmistress dead, Moinet finds himself caught breaking windows once more, strangely using his previously confiscated slingshot. One of the teachers asks the boy who gave him back his slingshot. Madame Delassalle, Moinet explains. And while the suggestion of a ghost was proven false before, there’s nothing to dispel Moinet’s claim now, at least not for the audience. At this, Clouzot warns the audience with a final frame, saying, “Don’t be devils. Don’t ruin the interest your friends could take in this movie. Don’t tell them what you saw.” Hitchcock would later use a similar message before screenings of Psycho, a gimmick that fanned moviegoer interest even more. To be sure, Clouzot and Hitchcock shared more than just an affinity for source material; they approached filmmaking and even marketing in similar ways. They storyboarded their films in pre-production, detailed every camera movement and blocked every shot before any cameras started rolling. Both were obsessive masters of their craft. 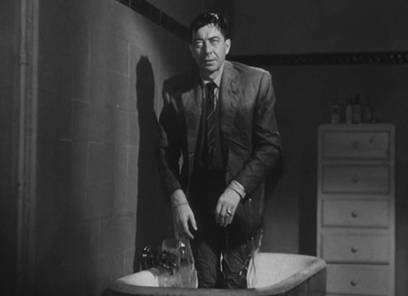 Despite Diabolique‘s lasting influence on Hitchcock, who concocted Psycho‘s shower scene to rival Clouzot’s bathtub climax, the film and Clouzot was met with some major criticism upon its release—for the story’s punishment of its characters, in particular. The film’s treatment of Christine through endless suffering and ultimately victimization, then death, left viewers taken aback and downright shocked. No doubt, the character was informed by Clouzot’s time at the sanatorium. Regardless of Clouzot’s edgy filmmaking, he was nonetheless considered a member of the older generation of directors, what critics in the Cahiers du cinéma called the “Tradition of Quality” in a derogatory sense. André Bazin led the pack of François Truffaut, Jean-Luc Godard, Claude Chabrol, and Jacques Rivette against directors that operated in what they considered the bland style of conventional French cinema. With the New Wave, they broke out of such conventions with films about everyday life, shot on location with inexperienced actors. But they missed the mark with Clouzot, as no one in France was making films as callous, suspenseful, and influential as he. Diabolique‘s influence cannot be overstated and extended not only to Hitchcock’s Psycho but other major works of the suspense genre. Michael Powell’s Peeping Tom (1960) treads similarly dark water, and Roman Polanski’s claustrophobic, stressed triangles on Knife in the Water (1962), Cul-de-sac (1966), and other films draw from this source. Clouzot once explained his motivations for Diabolique saying, “I sought only to amuse myself and the little child who sleeps in all our hearts—the child who hides her head under the bedcovers and begs, ‘Daddy, Daddy, frighten me. '” A statement like this says something about Clouzot’s enduring character, which is that of a tortured soul attracted to suffering because that’s what he knows. It’s a sentiment no doubt informed by his years in recovery, working under Nazi film executives, and surviving WWII only to be nearly banned from filmmaking altogether. If the adage is true that great art requires suffering (what Friedrich Nietzsche called “The only thing that can prove today whether one is worth anything or not”), then Clouzot’s art is indeed greater than most. With artistry as merciless as his narrative, Clouzot offers a story that later films and filmmakers would make into fun murder mysteries and twisting paranormal thrillers. 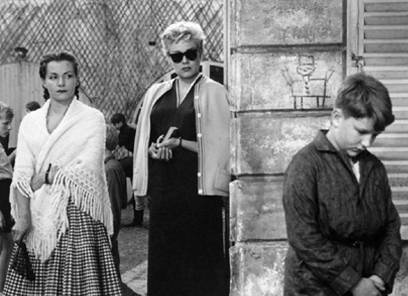 Clouzot established those standards in Diabolique, without allowing his audience the benefit of periodic reprieves. His story is cruel and mean, and survived only by the viewer’s belief that Christina may have continued on as a ghost. After all, what is fun about murder and the dead returning as ghosts? Rather than an escapist lark as Hitchcock might provide, the whole experience of Diabolique feels like the bomb that’s about to explode. And by the end, when the bomb goes off, the unforgiving quality of Clouzot’s cinema cannot help but leave the viewer scorched and scarred.